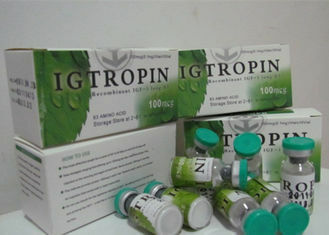 IGF-1 LR3, Long R3 IGF-1, IGF-1- Insulin-like Growth Factor – is an experimental drug that represents the next generation in performance enhancing in bodybuilding athletes. This peptide hormone also has the promise of becoming the ultimate fountain of youth. As the world has finally caught on to the fact that world-class athletes from all sports have been using steroids and other performance enhancing drugs (PEDs), the athletes themselves have moved on to the next generation of substances. Long R3 IGF-1 is mainly secreted by the liver as a result of stimulation by Human Growth Hormone (HGH). Almost every cell in the human body is affected by IGF-I, especially cells in muscle, cartilage, bone, liver, kidney, nerves, skin, and lungs. In addition to the insulin-like effects, IGF-I can also regulate cell growth and development, especially in nerve cells, as well as cellular DNA synthesis. Stimulates muscle growth and has been shown to benefit the heart (a muscle). Encourages the absorption of Chondroitin Sulfate and Glucosamine Sulfate (also found in Velvet Antler). IGF-1 LR3 is a hormone just like HGH, but IGF-1 is the most important growth factor that the body produces. IGF-1 is much more powerful than HGH. Currently the license to conduct human trials using IGF-1 is held by biopharmaceutical company Tercica and is limited to the study of children suffering from growth failure due to IGF-1 deficiency. Even though the human study of IGF-1 LR3 is extremely narrow and limited to kids, the fact that this substance has been studied on rats and humans and is in the hands of people in labs means that the genie is out of the bottle. IGF-1 has been used in lab studies since at least the late 1990s; so many people have had access to this drug for quite a long time. And there are people with tons of money who would love to get their hands on this stuff. Which is the best human growth hormone? There is no such thing as "the best HGH" the substance is either real growth hormone (somatropin) or it is NOT! Human growth hormone is a very fragile, large molecule which is comprised of 191 amino acids, linked in very specific order and shaped to very specific form. In that regard there is no room for differences! Note: It is NOT POSSIBLE to take human growth hormone as a supplement in spray, pill or sticker patch form! Sprays, pills and patches are marketing scams used by the supplement pushers. The growth hormone molecule is too fragile to survive room temperatures or vigorous shaking. It is also too big to pass through the skin. If you read the fine print you will usually find a note that there is no actual growth hormone but rather "growth hormone promoter" which is supposed to make your body produce more of its own growth hormone. So which is the best HGH? To recap the above differences - growth hormone can be either real or not, high purity or low purity, western or asian priced, liquid or freeze dried and it comes packed in differently dosed vials. The best growth hormone would then obviously be the high purity, 191 amino acid sequence, freeze dried, original and realistically priced one.